A Pavement Sign can add a little more presence to your business by catching the eye of your customers without them looking up at your fascia. They are a cheap and cheerful way of advertising new products and special offers without impacting the look of your business and can be removed on a daily basis for safe keeping. 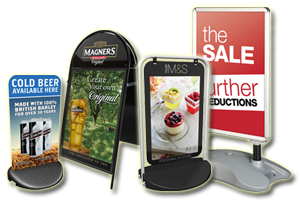 We have a large selection of stock standard pavement signs for you to choose from and nearly all have added options such as colour, poster inserts, chalkboard areas and the ability to digitally print any logos and pictures keeping all your signage uniformed and looking professional. 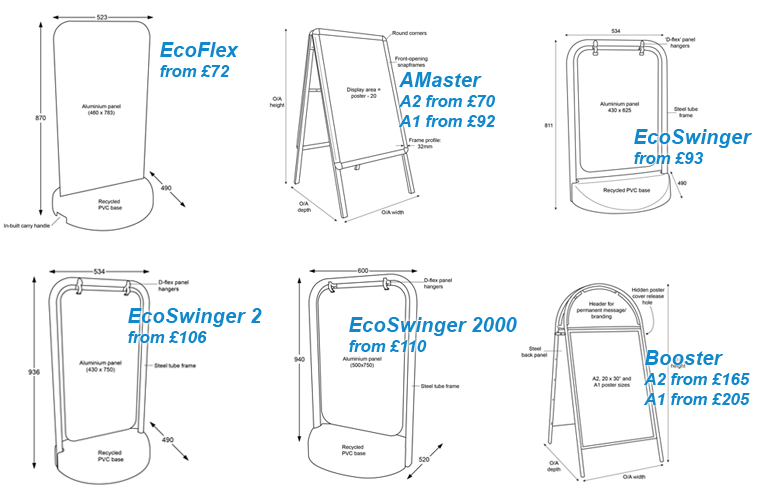 All layouts and quotations for pavement signs are free of charge but if you don’t have time to contact us then here is a rough guide to prices for just a few of our stock pavement signs. Upgrade you pavement sign to a hand made Wooden A-board. We offer the finest quality wooden signs custom made to suit your needs. These also come with the options of having poster inserts, chalkboard areas and digital print work. Our wooden A-boards are hand painted and can be colour matched to existing signs! Contact us for a quote on the right pavement sign for you or continue to our portfolio page for more professional signs by Trademark Signs.